Jurors in the trial of George Zimmerman found him not guilty in the shooting death of Trayvon Martin. A Florida jury acquitted George Zimmerman on Saturday night in the shooting death of Trayvon Martin, which touched off an intense national debate about race, guns and self-defense. The verdict was returned by a jury of six women who worked into the night on their second day of deliberations. They also had the option of convicting Zimmerman of second-degree murder or of the lesser crime of manslaughter. 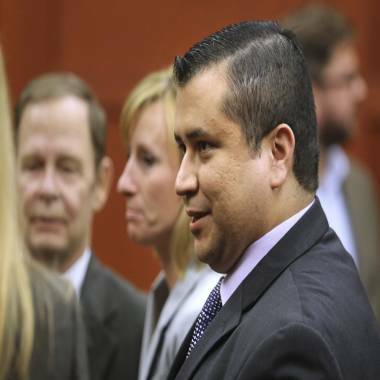 Zimmerman was expressionless as the verdict was read, then turned to shake the hand of one of his lawyers. In the courtroom, his family held hands across a row and cried. Tracy Martin, Trayvon’s father, said on Twitter he knew that his son was proud of the fight waged on his behalf. “Even though I am broken hearted my faith is unshattered,” the father said. “You had a 17-year-old kid who was minding his own business, wearing a hoodie, and gets accosted, gets followed by an individual who wants to be a cop,” he said. A court spokeswoman, Michelle Kennedy, said that the jurors had “no desire to speak to media,” and she warned reporters that an order protecting their anonymity was still in effect. George Zimmerman leaves the courtroom after the verdict. Zimmerman, 29, who is of white and Hispanic descent, said he was acting in self-defense when he shot the unarmed Martin, who was black, during an altercation in a gated community of Sanford, Fla., on Feb. 26, 2012. Another of Zimmerman’s lawyers, Mark O’Mara, said that the case had become a “civil rights event,” and that Zimmerman had been made a scapegoat. As debate over race, guns and Florida’s “Stand Your Ground” law swirled, a special prosecutor appointed by the governor announced April 11, 2012, that Zimmerman was being charged with second-degree murder – a move that his supporters said was meant to quell the public outcry. “That child had every right to be where he was,” prosecutor John Guy said in a closing argument. The defense told jurors that Zimmerman was just doing his civic duty when he was ambushed by Martin, punched in the face and slammed repeatedly into concrete before he fired a single shot that pierced the teen’s heart. “That’s cement. That is a sidewalk. And that is not an unarmed teenager with nothing but Skittles trying to get home,” O’Mara said. Over the course of testimony, 56 witnesses took the stand, including Martin’s and Zimmerman’s parents, who disagreed about who was heard yelling for help in the background of a 911 call made by a resident of the Retreat at Twin Lakes during the fatal confrontation. Zimmerman did not testify, but his call to the non-emergency police line, his statements to investigators and even a TV interview were part of the evidence jurors could consider. The panel was also given photos of Zimmerman’s injuries and pictures of Martin’s body at the scene and at the morgue. Well aware of the passions surrounding the case, soon after the jury began deliberations Friday, the Seminole County sheriff appealed for calm whatever the outcome might be. "We will not tolerate anyone who uses this verdict as an excuse to violate the law,” Sheriff Donald Eslinger said.